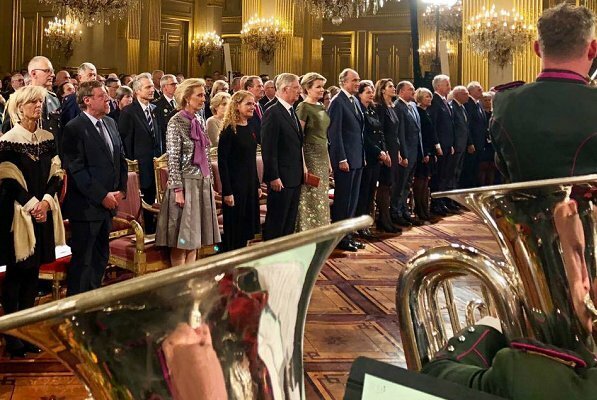 Yesterday evening, King Philippe and Queen Mathilde of Belgium held a gala concert at the Royal Palace of Brussels on the occasion of the 100th anniversary of the end of the First World War. Princess Astrid and Prince Lorenz also attended the concert. 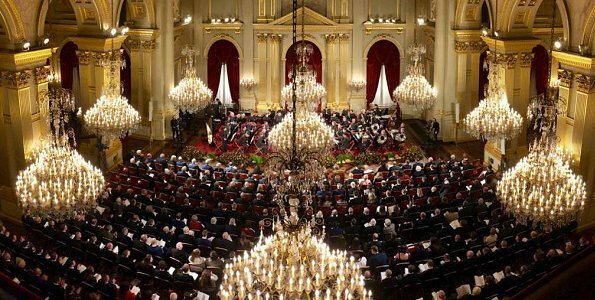 The concert was performed by The Royal Symphonic Band of the Belgian Guides composed of 84 strictly selected artists and a Trumpeter Corps of 19 first class musicians. Queen Mathilde looks fabulous . What a gorgeous venue. 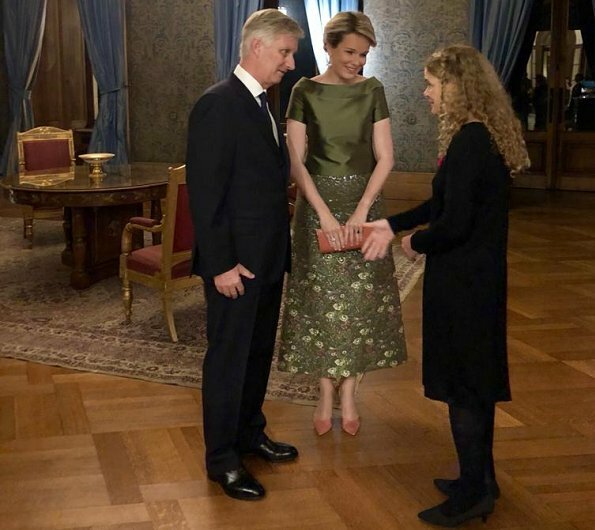 And Queen Mathilde's jewel-tone top and skirt are a beautiful color (we seldom see her in green, and this subtle shade is gorgeous) and well-suited to the event. That is Julie Payette, Governor General of Canada, with the king and queen in picture #3. Quite obviously she is there in the capacity of representing Canada in the commemoration of the end of WWI, as many Canadian's lives were lost in battle on Belgian soil. I am certain there were other foreign dignitaries present also. Very, very nice - I like this sage/Olive green and love the skirt. What a beautiful outfit. Very on trend and really glamorous. Queen Mathilde ahs been looking great recently. I really like this outfit, autumn colors, with enough embellishments to make it formal, also love the choice of color for the complements. Generally Mathilde's style is not my favorite, but I really love it today. The shade of her shoes and handbag is a very beautiful neutral. Mathilde's dress is gorgeous! The skirt looks reminicent of a Monet from a distance. She has paired it beautifully with the terracotta shoes and bag. Spot on, she nailed it.